“It’s been almost a year since eighteen-year-old Ella Rodriguez was in a car accident that left her crippled, scarred, and without a mother. After a very difficult recovery, she’s been uprooted across the country and forced into the custody of a father that abandoned her when she was a young child. If Ella wants to escape her father’s home and her awful new stepfamily, she must convince her doctors that she’s capable, both physically and emotionally, of living on her own. The problem is, she’s not ready yet. The only way she can think of to start healing is by reconnecting with the one person left in the world who’s ever meant anything to her—her anonymous Internet best friend, Cinder. I've been eagerly awaiting the release of Cinder & Ella by Kelly Oram ever since I first read it's synopsis. It sounded like a fun and romantic story that I was bound to fall in love with. And, now that I've read it, I have to say I was not disappointed! 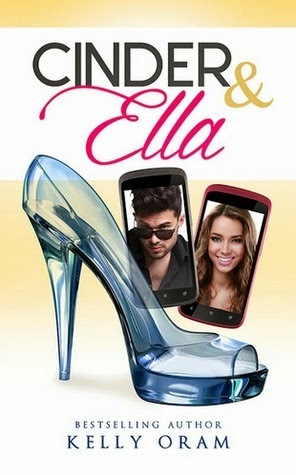 Cinder & Ella tells the story of eighteen year old Ella, a book and movie lover who shares her opinions on her blog. And those opinions catch the eye of Cinder, a.k.a teen heartthrob, Brian Oliver. Cinder and Ella are best friends, anonymously online, but still friends. But when Ella is an an accident and her whole world falls apart, it's Cinder she turns to, but will his status as Hollywood's leading man keep them from being together? It's girl meets movie star, classic wish fulfillment, but isn't that what any Cinderella story is about? But it's not all happy romance and adorable movie star antics. Ella is going through some serious family and personal issues and I found myself teary-eyed more than once. I love the way Oram switches things up a little and uses The Cinder Chronicles as a way to get away from the standard Cinderella elements and really add more depth to the retelling. Both Brian and Ella have read The Cinder Chronicles and their entire relationship is based on this shared love. The story serves as a nice parallel to Ella and Brian's relationship throughout the book and gives both characters some insight into their relationship, which is fun to read. It's nice to see characters geek out about the things they love. It makes me want to geek out along with them! If you enjoy Cinderella retellings, or just love a good romantic contemporary, then Cinder & Ella is definitely the story for you. I highly recommend it, and all of Kelly Oram's novels because they are all fantastic! For more about Cinder & Ella check out these sites!